My ls male human agent married Ensign Temple. But when he got Kaliyo back in Knights there was an option to end their romance. I hope they game didn't glitch and forget he was married to Temple not her. My male human agent had the same issue, no romance dialogue during the chapter, no letter at the beginning of KotFE, but in the final chat he had a romance available to break-off. If it helps with narrowing down the issue mine didn't romance Temple or any other character. The game seems to be treating male Imperial Agents as though they romanced Kaliyo, because she's the "primary" LI, while Raina Temple is secondary, even though she has a full romance arc. It seems to be a similar bug to how romances weren't acknowledged properly for a lot of Imperial characters with the SOR intro cutscene. I imagine male Warriors who romanced Jaesa will run into the same problem Imperial Agents have now when (if?) she returns since Vette is also the "primary" LI for them. Nonne mei fratres congruitis nobis nostram cruore ferroque humum recipienda esse aut Imperium Aeternum quae omnia speremus peregerimusque vere perdat? Conquering the Darkest Places, the ongoing misadventures of a Sith doing what's right by her. I think my agent got the right email. I have done this recently and can confirm that I got the correct email from Temple at the start of KotFE, so the code determines it correctly there. 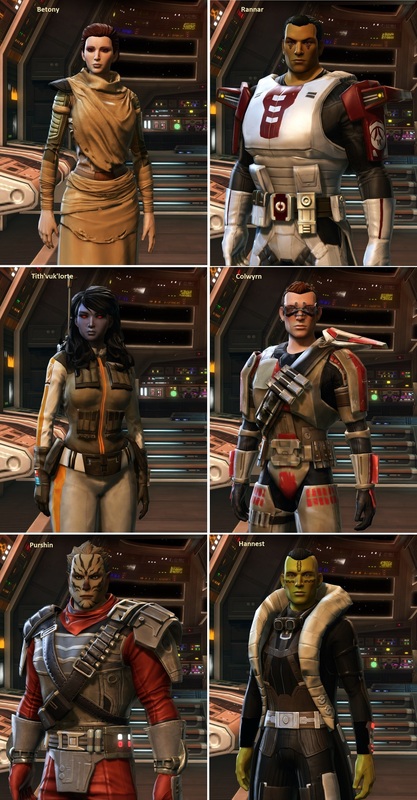 She was also my highest influence character, but my male Chiss was still made to end a non-existent romance with Kaliyo. Strange how the romance history gets assessed in different ways in different places in the code. This may not mean anything, but I checked on IMDB and Temple is not among the characters in KotFE. Others are listed even though we have not met them yet, like Kira and Mako, so I am guessing Temple and others have been written out of the game. Maybe the devs just don't know how to handle that so are basically not trying and are imposing some kind of default history on the character. I hope that is not the case and they are just not finished writing all the characters back in yet. Kira and Mako are indeed in KotFE. For about ten seconds in Chapter I. 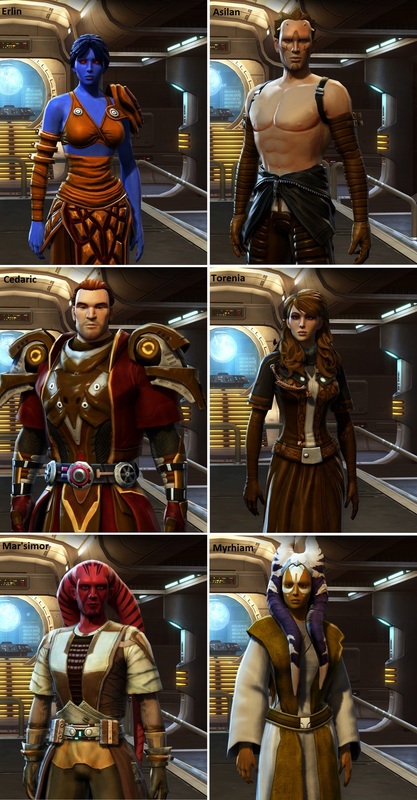 The first LI met in the class stories are the ones who speak during Chapter 1 when the PC leaves their ship and again when they free their ship and tell their companions to stay or leave. 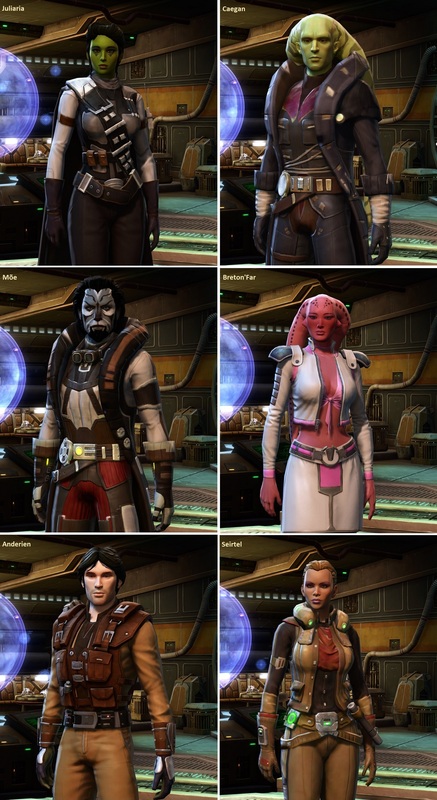 So Kira, Iresso, Corso, and Jorgan for Republic characters and Vette, Andronikos, Kaliyo, and Mako for Imperial ones. They're credited for those speaking parts even though they're small. The others will probably be back in Season 2.